It’s high time your Gin cocktail tasted like actual Gin. Leopold Bros. was founded by Todd and Scott Leopold in 1999. Todd has degrees in Malting and Brewing and Scott has his degrees in Economics and Industrial Engineering. These two brothers has since done the sensible thing and founded a distillery — first in Michigan, then moving everything back to their home state of Colorado. Their core line-up today is winning lots of awards and consists of Gins, Whiskeys, Vodka, Aperitifs, an Absinthe Vert, and a few other tidbits. 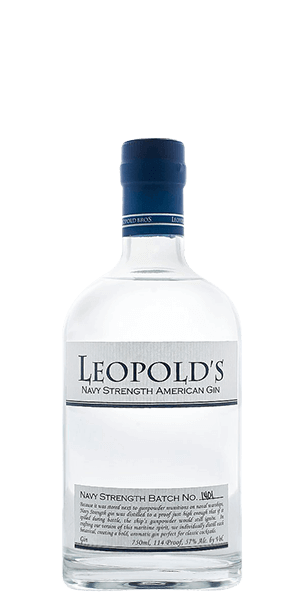 The fist thing you need to know about Leopold's Navy Strength Gin is that “Navy Strength” means 57% ABV. They also doubled up on the botanicals, so you not only get the power of that high proof, but you get extra juniper, bergamot, coriander, and cardamon. That all adds up to what is the base for a Gin and Tonic that surely won’t get lost in the tonic. It makes simple cocktails feel less like a cop-out and more like what a real Gin cocktails were supposed to taste like. What does Leopold's Navy Strength Gin taste like? The Flavour Spiral™ shows the most common flavours that you'll taste in Leopold's Navy Strength Gin and gives you a chance to have a taste of it before actually tasting it. Very tasty. The overproof hides behind the spiciness of the gin. My favorite gin to pair with a craft tonic.